This magnificent and large historiated initial D illustrated with a monumental scene of the Coronation of the Virgin was recently described by Gaudenz Freuler as "one of the most splendid examples of the art of Renaissance manuscript illumination in Perugia." 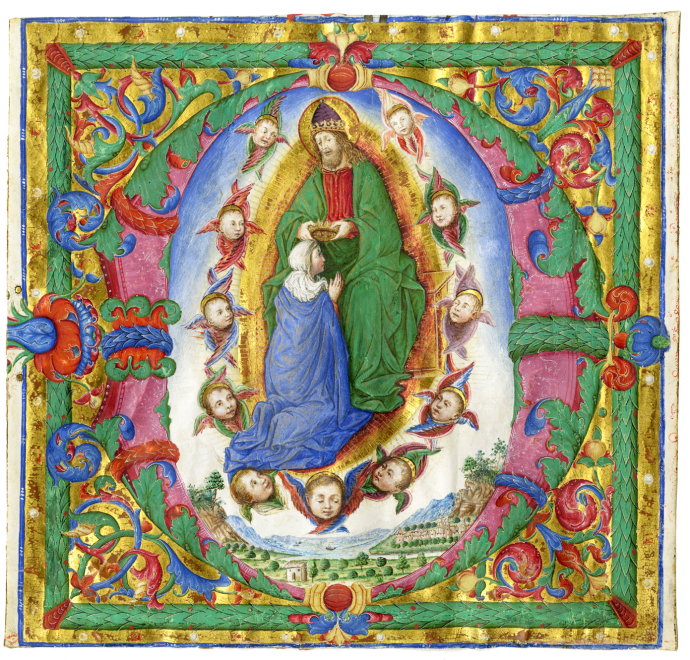 This magnificent and large historiated initial D illustrated with a monumental scene of the Coronation of the Virgin was recently described by Gaudenz Freuler as "one of the most splendid examples of the art of Renaissance manuscript illumination in Perugia." It is well-known in the literature, because it belonged to many important collectors of cuttings and single leaves, including Sir John Pope Hennessy, and has long been attributed to Bartholomeo Caporali, a Perugian painter working at the beginning of the High Renaissance,. We have retained that attribution here, notwithstanding emerging new research on this artist, which reassigns some of his oeuvre to other Perugian painters, including to Tommaso di Mascio Scarafone, the attribution tentatively proposed by Freuler. In the last half of the fifteenth century, Bartholomeo Caporali worked as a fresco painter and an illuminator in Perugia, where he transformed Perugian illumination through the lens of the Florentines, specifically Fra Angelico and Benozzo Gozzoli. He collaborated with his brother Giapeco (died 1476). Their style is difficult to distinguish one from the other, and some of their creations have since been reattributed to contemporaries such as Pierantonio di Niccol di Pocciolo. Freuler agrees with earlier cataloguers that the opulence of the ornamental jewelry and the tangle of colorful foliate and floral decoration in the Coronation is similar to creations by the Caporali workshop and recalls the Missal recently acquired by the Cleveland Museum of Art. The central composition, however, is not so easy to situate within Caporali's work. It is based on a lost Coronation of the Virgin by Fra Filippo Lippi, reused by the artist in 1469, the year of his death, in the Cathedral of Spoleto. The present miniature must, thus, postdate this fresco. Freuler argues that it shows the influence of the great Perugian painters Pinturicchio, Perugino, and Signorelli. The largest group of important miniatures previously attributed to Caporali, the depictions of the gates of Perugia, is now ascribed to Pinturicchio and to a related painter, Tommaso di Mascio Scarfone. Freuler tentatively suggests that the present painting may also be by Scarfone. In spite of the uncertain state of the attribution, the miniature emerges as an elegant example of Renaissance painting at a critical moment in its history. Carlo Prayer (1826-1900), Milan, his collector's mark in the lower left corner (see Lugt 2044); Maria Shira Leila Méndez de Bernasconi (inscription on the verso; sale London, Christie's 24 June 1987, lot 323); Sir John Pope-Hennessy, Florence and New York (sale New York, Sotheby's, January 1, 1996, lot 10); Paris and London, Les Enluminures, BEL, 1996, no. 17; Private Collection, Austria (F. Zeileis, Più ridon le carte, 3rd ed., Rauris 2014, pp. 401-402). published Sandra Hindman, Milvia Bollati, BEL, London 1996, p. 44, no. 17; for comparisons, Elvio Lunghi, "Bartolomeo Caporali," "Giapeco Caporali," in Dizionario biografico dei miniatori italiani, ed. Milvia Bollati, Milan, 2004, 133-136; Jonathan, J.G. Alexander, "The City Gates of Perugia and Umbrian Illumination of the Fifteenth Century," in The Medieval Book:Glosses from Friends and Colleagues of Christopher de Hamel, ed. by J. H. Marrow, R.A. Linenthal and W. Noel, 't Goy-Houten, 2010; Stephen N. Fliegel, The Caporali Missal: A Masterpiece of Renaissance Illumination, Cleveland, 2013.